Posted on June 4, 2014, in Office 365, PowerShell, SharePoint and tagged Bulk Copy, Bulk Import, Bulk Move, Bulk Upload, Folder Structure, OneDrive. Bookmark the permalink. 40 Comments. Thanks Benjamin, I’ve updated the post to include Sharegate and have heard good things about your products (although I haven’t had the opportunity to use them personally). Hi Cameron, does OneDrive preserve versioning? Can you elaborate more on the question? Are you trying to bulk upload multiple versions of the same document and end up with one ‘latest’ document in SharePoint with other documents as SharePoint ‘previous versions’ of the document? Thanks. In a Documents Library you can turn on Versioning, which preserves a version of a document each time you edit and save the document. With “minor version” selected, documents will be listed as 1.1, 1.2, 1.3 etc. You can easily revert to an earlier version by clicking on the version number of interest. So it is one document but with a record of previous versions. Will that be preserved when uploaded via OneDrive? Thanks for clarifying the question. – Only the latest version of the file is stored in the local sync’d folder on your machine. – When you open, edit, save the file (from your local location) then when a sync happens in the background you changes will go in as a new version. Hi, I would like to suggest a third party tool as well. We’ve had many great responses on this tool and we’re always in for feedback. One of its main features is adding metadata to the documents while migrating. Hi Vince. I don’t think your local file permissions will sync to SharePoint. Once items have synced to SharePoint you can right click on the folder (local folder that has been synced) and you get a OneDrive | Share… option which really just opens the relevant webpage in SharePoint to allow sharing of the item. SharePoint security cascades down the folder structure, so a solution for you might be to manually create the top level folder in SharePoint and assign correct permissions, then use OneDrive to upload all descendant folder structure. How can this be done on a mac? Sure, I took a look at your website and looks like a useful tool. I haven’t had a chance to try it out but I’m happy to add it to list of commercial tools. Thanks for bringing it to my attention! Thank you Cameron much appreciated! I would suggest dms-shuttle (http://dms-shuttle.com/downloads) for uploading folder structures to SharePoint. Bulk editing of metadata is supported too. This is a commercial tool, but there is a free trial version. I know nothing about SharePoint and have nothing fascinating to add. But THANK YOU. You just saved me hours! I just wanted to copy folders with nothing in them and could not find this anywhere on Microsoft help. I just found out that your preferred solution doesnt work with PictureLibraries, they cannot be synced. You have a better solution? Hello, I’ve attempted to setup the Sync via OneDrive for Business to a new SharePoint library as you describe above, all appears normal except I’m asked to sign in to account to access the library, I go ahead and enter proper account credentials, but then it sits there and does nothing, no errors or prompts. If I hit X to close the office sign in windows (looks exactly the same as the local copy of Office Activation prompt), I get the OneDrive for Business Error “We can’t connect to the specified SharePoint site…. The account is that of the Office 365 admin and the Site Owner/creator and full rights to the Document library. I feel I’m missing something, but not sure what. Any ideas would be appreciated Thank you. I got it working and boy was I confused about OneDrive and OneDrive for Business App(s) and there purpose, even as a Techy person lol. We haven’t really touched this feature at all until now and it was my understanding that “OneDrive” was for Personal accounts ( I have one of those and use it all the time) and “OneDrive for Business” was for business and enterprise accounts that have SharePoint feature as a Sync tool, plus the OneDrive are for each User. I was very wrong there, as I search and learned about these two Apps (both showing on Win 10 OS) I wasn’t sure if I need to disable the OneDrive or not, then read a blogs from MS and in those too, I wasn’t always 100% which App they were referring too, but a few times I saw mentions of seeing connections to both personal and/or business in the Windows Explore and saw same screens I see are the OneDrive App for signing in for OneDrive for Business. for the heck of it, I decided to try signing into to “OneDrive” with business account and well, it worked and now i see both a OneDrive -Personal and OneDrive- SharePoint site name, and then now your instruction above work. Perhaps I’m just the dumb one here or overthinking it perhaps.. but I really thought those two Apps were not interconnected to each other. Lots to Learn here I see. Hope this might help someone else who may have thought the same. Thank you for your input. I’m glad you got it working in the end. I agree the naming of the two products is confusing. Thanks for sharing your experience. Hi Cameron. Love your work. Often read your articles and am very impressed. But this time…Umm No mention of the 5,000 file limit – come on!!! No mention that the documents will be checked out if mandatory metadata is not completed??? And i’m really surprised that you didn’t sneak in a mention of the brilliant ‘Send to SharePoint’ on the context menu of OnePlace. Hi Mike, thanks for adding the link to the technical limitations that exists with OneDrive sync, this is very valuable info for anyone looking at the OneDrive sync option. Despite it’s problems the OneDrive sync is still probably one of the best out-of-the-box methods for a user to bulk upload a folder structure to SharePoint. You’re not going to beat a 3rd party product that is designed to do this and give a rich experience around validation and applying metadata on the way up though, so if your requirement can’t be satisfied with the free OneDrive option then unfortunately it’s time for a 3rd party product, or some custom dev/scripts 🙂 Thanks for the OnePlace ‘Send to SharePoint’ plug! 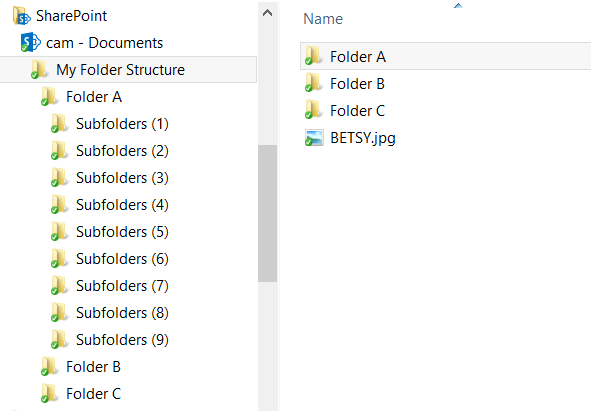 Quick question, I have created folder structures using python and then used the explorer view to upload files. I want to distribute files to pupils. Each pupil has a named folder with a specific set of sub directories. 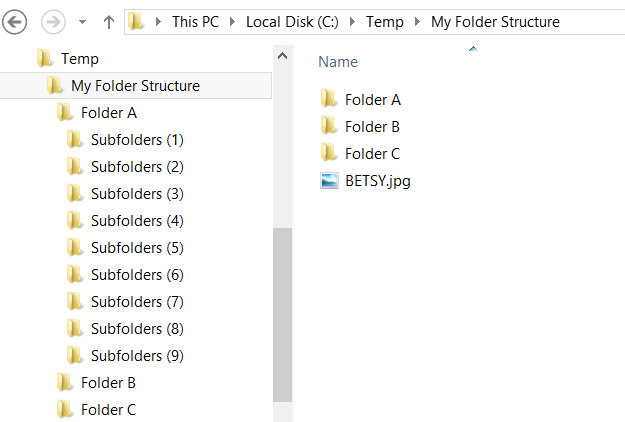 At the moment I have to recreate the whole folder structure including the new files and then repeat the process (as we are only adding new files there is little risk of damaging existing documents) Would any of the tools that you have seen be able to upload files to specifically named sub folders eg every pupils computing ot English folder? Hi Rick. I’m not aware of any tools that will do this out of the box. To me it seems like you could split your problem into 2 and try to tackle them individually. I’m assuming that all student directories are within the one SharePoint library. If that’s the case you could use OneDrive to sync that library to your PC. That then gives you a local folder structure that will stay in sync with what is SharePoint. I.e. if you add any files to the student folders they will sync up to SharePoint. So that’s part 1 (and you can do that pretty easily, depending on size and number of files the initial sync may take a while). Hoo boy. I think I have opened up a hornet’s nest. Perhaps I was too quick on leaping and not long enough on looking first! I wanted to easily move Word documents from an old Windows 7 to only one folder in Sharepoint. I synced. ALL of mine and my colleagues’ folders from the beginning of time on Sharepoint uploaded to my computer! How do I un-sync!??? That doesn’t sound great! Try this for a fix. I’m not sure if this will automatically clean up all the folders and files you’ve already synced. You may have to delete them from your PC manually BUT ENSURE you’ve stopped the sync of the folders you don’t want first and I’d leave it a while before manually deleting. And even then I’d just try deleting 1 file and wait a few hours to ensure it really has stopped syncing (your worst case scenario is that if it’s still syncing then deleting from your PC will also delete it from SharePoint). If you do find that this happens, you can use the Recycle bin in SharePoint to restore your files. Wow. Option #6 saved me so much time worked perfectly for what I needed. Thank you Cameron! This doesn’t work for me – it won’t let me right the folder that is created locally. I tried unticking read only but it still gives an error. Hi Matt, I haven’t encountered this issue before. While this thread post is a bit old, it does seem to be in the same area and goes through a few troubleshooting steps that may help identify the cause. Here’s a free open-source tool doing just that. It also preservers Metadata and can copy files between SharePoint Versions. Thanks for the link George, I’ll take a look. Thanks for sharing this great post. It is important and very useful, and the blogs are nice to share everyone. I came across your website after searching all day on the internet for solution and I like your work here. I have recently started a new job in a company and been entrusted to work with Sharepoint which I have never use before. Is there any method or script or batch file that I can use to run to do this job faster?